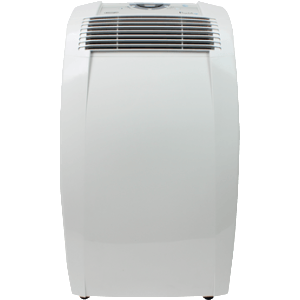 DeLonghi - PACC100E : Portable Air Conditioner Review • The Air Geeks, reviews of air conditioners, dehumidifiers and air purifiers. The DeLonghi PACC100E is a portable air conditioner that offers a cooling capacity of 10,000 BTU and three operational modes. This unit has a dehumidifier function and recycles the condensate for cooling your room. It is suitable for small and medium-sized offices, bedrooms, living rooms, computer rooms, server rooms, et cetera. If you are looking for an air cooling system that will enhance the comfort of your room, then you need to consider this unit. Are you planning to buy the PACC100E for your cooling needs? If you are interested in this unit and you are looking for reliable information about its performance, feature, strengths, or weaknesses, we are glad to inform you that we have all that information right here. Do you want to know if this air conditioner produces noise? Or are you interested in knowing if it consumes excess power or produces excess heat? To start with, we will look at its features. The PACC100E is a 10,000 BTU air conditioner that offers three operational modes: air conditioner, dehumidifier, and fan only. This unit is suitable for relatively small rooms that are not larger than 350 square feet. Furthermore, its power needs are lower compared to most units of same capacity. Have you been struggling to control high temperatures and excess moisture? 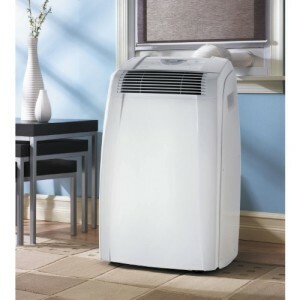 This air conditioner cools air and removes excess moisture to ensure that your room is truly comfortable. The air conditioning function captures up to 49.6 pints of moisture in a day. If the levels of moisture are high, the dehumidifying only function is the best option. This mode pulls up to 76.08 pints of moisture from the air per day. Just like most home appliances that have a fan and a compressor, the PACC100E produces sound. However, we have noted that this unit is quieter than most units of same capacity. Furthermore, it offers impressive features that make it easy and convenient for you to control the environment of your office, bedroom, living room, et cetera. It offers a 24-hour digital timer that allows you to preset it depending on your cooling needs. Moreover, this cooling unit offers a digital thermostat and an intelligent remote control. Pretty cool! (pun intended, bah-dum-pshh)! The PACC100E recycles the condensate to cool the air. This highly effective condensate recirculation process ensures a dripless and bucket-less operation. Are you looking for an air conditioner that you can easily move from one room to another? This unit features castor wheels and handles. These features enable users to move the unit from one position to another with ease and convenience. The front of the unit! If you are looking for a strongly built air conditioner, then you may need to think about another brand. We have noted that this air conditioner is fragile and can break easily. Although some units are durable, we have noted that most of them break after running for less than one year. Compared to most brands, the PACC100E is less durable. Although the PACC100E uses condensate recirculation to minimize the accumulation of the captured water, we have noted that these units are highly likely to leak water as compared to other brands. It is therefore important to keep the unit where you can easily monitor it. You should also ensure that the fixtures are tightly attached during assembling to prevent leaks. Runs quietly. We noted that this unit is quieter than most units of same capacity. If you are looking for a unit that you can use in your office or hospital, this system is a suitable solution. Effective cooling and low power needs. This unit delivers impressive performance while consuming minimum power. Leaks water. We noted that many cases of water leakage have been reported. This can be attributed to its poor design. Bulky unit. This air conditioner weighs 71.1 pounds and measures 17.8 x 13.5 x 30.3 inches. In case there is a need to send it for repairs or replacement, the cost can be high. Fragile unit. We noted that some of its parts can break easily during shipping. Cases of defective units are high than for other brands. This DeLonghi portable AC is big and bulky and heavy and draws 10A at 117 volts, but it's reasonably quiet and does a good job of cooling and dehumidifying the large room I bought it for. And when winter comes I'll roll it away until it's needed again next spring. Update May 2015: It's up and running again with no problems whatsoever. Update August 2015: It started to leak water. Had to put an aluminum pan under it." This machine works well, but contrary to the Amazon description condensation is NOT "recycled in the machine for dripless, bucketless operation." Maybe Amazon means something else by those words but to me it implies a fully-evaporative machine that does not need to have its water tank drained manually. This machine is only partially evaporative, at best. I don't live in a humid part of the country (Seattle) and I have to drain the tank at least once every day, usually more. That wouldn't be terrible if the tank were convenient to drain, but it's down at the bottom of the machine so you have to use a sheet pan and then delicately transfer the water to something else." At the Air Geeks, we have something for the Delonghi brand. Sturdy, reliable products with a touch of European class? Hell yes! However, as we just saw, this particular unit leaves room for improvement. Does the PACC100E meet the requirements that you are looking for? If you are impressed by it features such as the cooling capacity, condensate recirculation, user interface, modes, or any other feature, then this may be the right cooling solution for you. Although this unit offers some impressive features, we have noted that it is not durable. Furthermore, we have noted that it is fragile and can break after a short time. In case you think that none of these demerits is a big issue for you, then you can proceed and get this unit. This cooling system goes for $ 430.